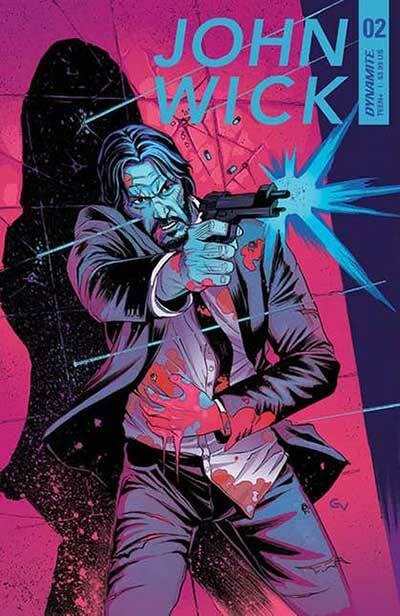 It’s been a few months since the first issue of John Wick hit the stands but this second installment of the comic book series from Dynamite Entertainment picks up the story nicely. Wick has wound up in El Paso and there finds The Continental. 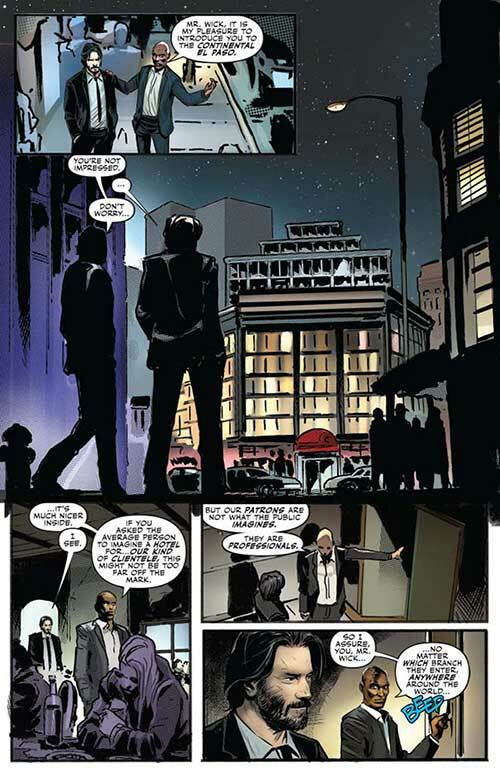 It’s much nicer on the inside, we learn, as Charon gives him the tour and explains the rules – the most important being no business is to be conducted on the hotel property. Their conversation is interrupted by the arrival of a beautiful woman named Maria. She knows of his skills, in fact, many of her own men have been permanently silenced by Wick. 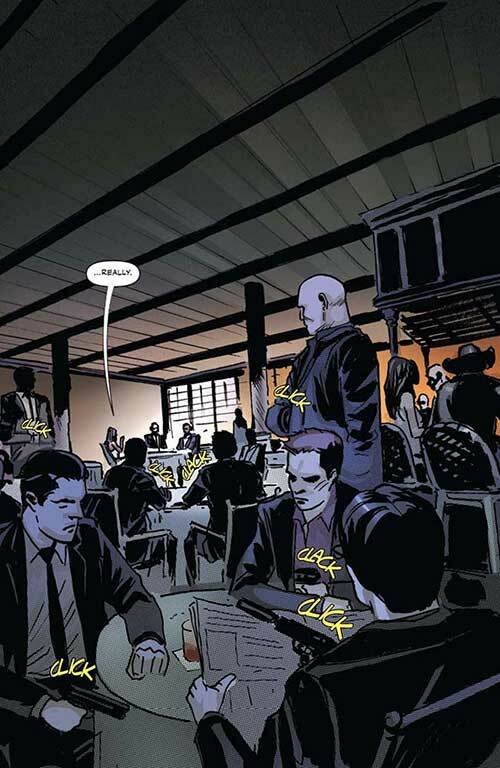 She sits with the two men and Charon mentions that he had been attacked by Pecos the night before – attacking a member of The Continental’s staff is a big no-no – but she says he’s no longer employed by the Russians and that he’s gone rogue. She also knows that Wick took him out, which he tells her was a ‘personal matter,’ just the type of thing, she assures him, that people in their line of business would do well to let go of. 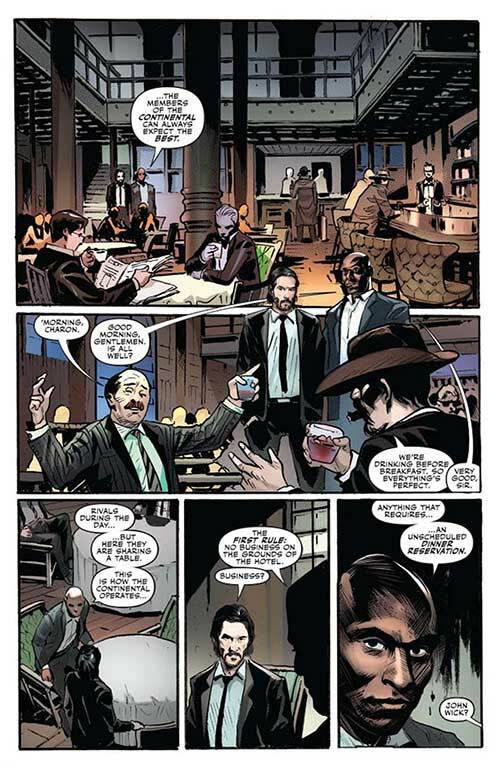 A nice follow up to the first issue, John Wick #2 gives you pretty much all you’d want from a good John Wick story. We get some snappy dialogue, some sexual tension and a whole lot of slick, stylish and completely gratuitous violence. 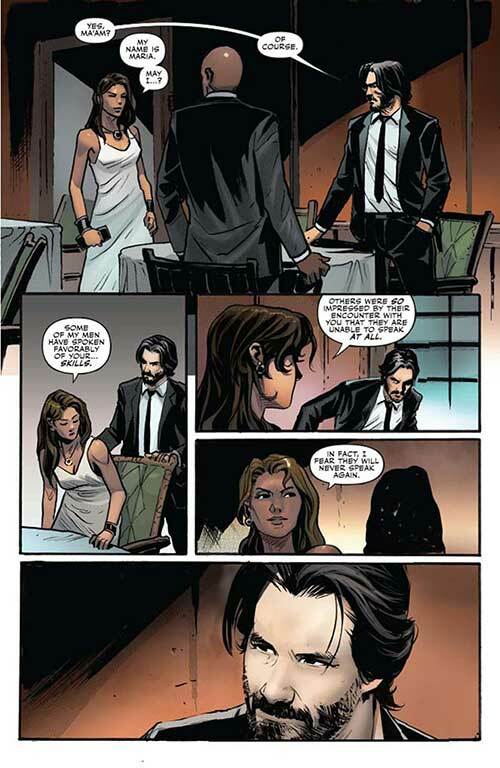 Greg Pak has a good feel for the characters, writing Wick completely in keeping with how he was portrayed in the two films that preceded this comic. He’s cool, calm and calculating – effortlessly cool and ultimately very dangerous. Even when put on the spot by Maria he doesn’t crack. When Billy and Buffalo show up towards the end, he goes into killing machine mode - which is great because it offers the chance for loads of action, but the planning and the strategizing is, in many ways, the more interesting aspect of his character this issue. At the same time, Pak’s script also drops hints as to Wick’s mysterious past, elaborating just slightly on what happened before the events in the first movie. Not quite an origin tale, at least not yet, these aspects still helps to build character and is an asset to the story. Giovanni Valletta’s artwork, nicely colored by David Curiel, is solid. He’s got an interesting style to his line work, it’s not hyper-detailed and it’s fairly thick, but it works well. Valletta portrays action quite nicely and does a fine job with facial expressions in medium and close-up panels. There are also some interesting ‘camera angles’ used throughout, sometimes evoking the widescreen cinematography used in the feature films, to give the book an appropriately cinematic look. This issue might be a few months late, but don’t let that put you off – if you dug the movies that inspired it, this new John Wick series should scratch that itch. Good stuff.